The Changing Seasons is here again. Like they say: “new year, new possibilities”, or perhaps you’re one of those people who don’t want to get out of your comfort zone? In that case: “New year, same, same”. Either way you’re welcome to join this challenge that will run throughout the year. 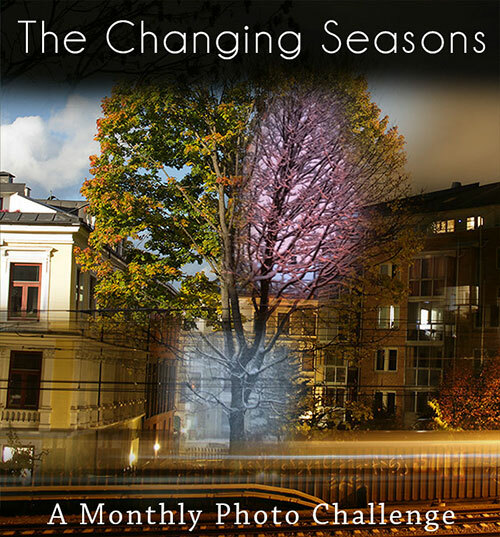 How you interpret “the changing seasons” is all up to you: a painting or perhaps a digital manipulation? One photo, a gallery with plenty of photos? Photos of the same place each month or different spots? A recipe (with an illustration photo that you’ve shot), your aging face, your declining health? Street, flash or portrait photography? Random photographer visiting Oslo Opera. The moon in Frognerparken / Vigelands Park. Gay discussion in Frognerparken / Vigelands Park. Will they manage to capture the moon inside their bowl? Only time will tell. A Couchsurfer having some good old statue fun in Frognerparken. The Barcode area seen from Ekeberg Park. The place where I sometimes go ice skating is the (fake) lake on the right side of this photo. Akrobaten Bro / The Acrobat Bridge, with the Barcode in the background. The Samí photo artist Gjert Rognli at the Vernissage of his show “Insomnulence”. Oslo Opera by night. January 2017. Ships at Rådhuskaia, Oslo. January 2017. Rådhuskaia / The City Hall docks. Christmas trees were still up (this was shot before the 13th day of Christmas when the decorations are removed). Astrup Fearnley Museum is seen in the background. Aker Brygge and Rådhuskaia seen from Akershus Fortress. The bikes in Bjørvika (in the Barcode area). A new Munch museum is being built vis-a-vis the Opera. Sunset seen from Tjuvholmen, Oslo. A chef in the Barcode area. A photographer and his friend. “Where do you betong?” Akrobaten Bro /bridge. At the shopping mall “Oslo City” where the security crew threw us out for photographing with DSLR’s. A Chinese photographer that we bumped into when I was on a photo walk with Niclas (the guy on the right). Coffee break in the cold weather. Street photo, Karl Johans Gate (gate = street). A Norwegian politician, Per Sandberg, with some woman. Ugo – the leather man at La Luna in Rosenkrantzgate. What else is new here in Oslo? 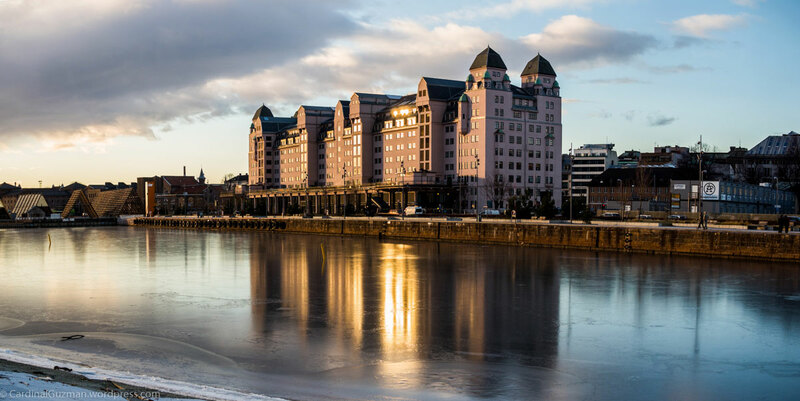 Next week my photo will be exhibited in a group exhibition at “Cyan :studio” in Oslo. My photo is one out of 72 photos (by other artists) and it’s possible for the visitors to vote for the photos at the exhibition. If you’re in Oslo next week, go check out the exhibition, vote for the photo you think is the best (not necessarily mine) and get some cultural input. Leave a comment with a link to your post and I will add it here. Link from your post to this post, so that I get a pingback. I will add it here. This entry was posted in Architecture, Black/White, Cityscape, People, Street Photography and tagged #MonthlyPhotoChallenge, #TheChangingSeasons, Astrup Fearnley Museum, Barcode, bikes, black & white photography, Cyan :studio, Ekebergparken, Frognerparken, Gjert Rognli, hdr, Oslo, Oslo Opera, panorama, Per Sandberg, photo exhibition, street photography, sunset, The Changing Seasons, Vigelands park, weekly photo challenge. Bookmark the permalink. Very fine galleries, Cardinal, especially all different captures of winter light and mood in the first one. I had a changing seasons lapse towards the end of last year. It will be good to start over. Sun promised here tomorrow so may be a chance of some new shots. Thanks Tish. It’s always good with a reset and a fresh start. Enjoy the sun tomorrow! I totally understand and I often do multi-challenges myself! Two galleries of beautiful photos that make me want to grab my passport and head north (waaay north for me). Or maybe I’ll just start working on my own Changing Seasons gallery to remind myself that NZ is pretty cool too. Yes, NZ is cool. I want to visit. Maybe we should do a house-swap! Haha, that’s a cool story Joanne! They didn’t seem like the “free photo shoot” type of persons…. Haha. What a stunning and very dramatic collection! Fabulous! Excellent and like Joanne said: “You get bonus points for including a koala”. Amazing beautiful captures 🙂 Loved em 🙂 Esp the sky and colors and the reflections 🙂 Wow! Thanks Nomad. Reflections are really wonderful when there’s just a thin layer of ice. Glorious galleries! I’ve put a couple together for tomorrow, but I want to go and shoot some stuff this afternoon. Maybe I’ll find something special I can use. It hasn’t been much of a month for photography. It looks like you don’t have snow on the ground, either. After our last snow, it got warm. And keeps getting warmer, which is not typical weather for January in New England. There’s no snow in the forecast, other than flurries or a bit of (maybe) freezing rain. Right now, it’s so warm you don’t need anything heavier than a sweatshirt. Yet we had snow earlier in the month. When the weather is like this, it’s impossible to know what the world will look like from one day to the next. I really love the work you do. it’s wonderful. You inspire me. Thank you! Thanks for the kind words Marilyn. No snow is good, heat is good too (less money spent on heating the house and more comfortable to be outside). Thanks Cardinal for your idea of posting photos each month. I got here (this time) through the Graceful WP photo challenge but yours was more useful for me. Hope you like my changing seasons at the other end of the world. Thanks Wish, it’s a beautiful entry. Botanical gardens are the best gardens. The moon was just luck: right place at the right time (and with the photographers mind/eye to spot it). Thanks Marilyn! January has been unusual here too. Here’s my January, Cardinal G. Cheers! I agree: It’s very interesting to see the entries from around the world. Thank you Lisa. Always love your galleries, Cardinal. If I *had to pick a favorite, I’d pick tow 😉 Oslo’s night Opera and its ships. Gorgeous light resting on the waters…Love them both! Hope January has been kind to you and yours! Well you have most definitely been inspired this month! Glorious galleries Max. And HUGE congratulations on getting your stunning portrait exhibited with Cyan. Well deserved. I wish I could be there to vote for your work. My hope for you in 2017 is that you can monetize your art so that you never have to go back to work for ‘the man’ again. You are a talent and an inspiration. Thank you so much Lisa! I hope for that too. An artists soul isn’t fit for a normal job, it’s like a bird in a cage. I didn’t get chance to use my ‘proper’ camera. These were taken with just my mobile phone. 304 photos in January?! My, you’ve been busy. I loved your photos of the dock. Princeton is beautiful in the spring but I miss being near the ocean. I’m hoping to get outside more in February, but if the weather continues as it has, February in Princeton will look a lot like January. I do have a lighthouse trip planned for the last weekend end of February so maybe I’ll have more to share. I have however, after many travels with my camera in hand, become more experienced and better at picking my scenes, so it’s not so much “this was interesting, that looks cool, oh lovely scene” like it used to be. The memory cards filled up quickly when my approach to photography was something like “anything & everything that looks somewhat nice”. Haha. A lighthouse trip sounds cool and definitely something worth sharing next month. Hopefully the light & shadows will be on your side! The exhibition turned out to be kind of joke, but it was still interesting to be a part of it. February will be cool and it’s just around the corner now! Sorry to hear the exhibition turned out to be a joke, but I’m hoping that you got something out of it anyway. Ok, interesting. I’m not sure where to start without sounding snarky. Obviously, the work you are doing is not what they were looking for. This also shows just how subjective art really is. The winning photo has absolutely nothing of interest or quality. She didn’t even bother to straighten the horizon. It won because of the text she wrote to explain the photo. If a photo needs an elaborate explanation, it’s not strong enough to stand on its own. Whatever happened to a picture says more than a thousand words? Yes, in my opinion it’s fine to explain a photo but if that’s required, it’s not as strong as it might be. This year, I am going to try harder! I hope to stick with your challenge through the year, Cardinal. Your galleries were wonderful and told me that I have to join in! Your colour Oslo gallery made me wish I was back there right now. And the b&w street photography gallery was fun and inspiring. But I also want to share my lovely hometown, St Albans, so will be back with that later today I hope! Here’s to a good photography February!